Bring yourself, your class, or your community group along to our Lanchester Interactive Archive Space and expand your knowledge one of Britain’s most important engineers and inventors. Either turn up, or email us to book a guided visit. Talk to us about how we can tailor a visit to your particular group interests. 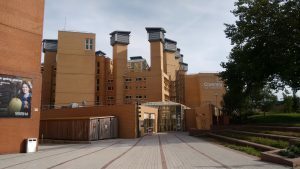 The Lanchester Interactive Archive is based on the second floor of Coventry University’s Frederick Lanchester Library. 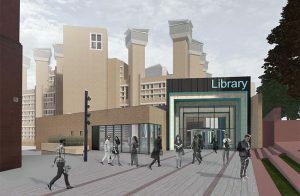 Currently the library is having major works done to improve the entrance to the building which will soon look like this. Find out how to navigate your way into the building in this post.  Turn left and press the door open button on the left hand side.  Walk through the two sets of doors and head towards the reception desk on the right.  Our friendly reception staff will give you a temporary visitor badge and let you through the barriers.  Don’t mind the students and walk straight ahead to the back of the room where you will find the lift and stairs.  Journey up to the second floor and find the Lanchester Interactive Archive Space on your right hand side. The Lanchester Interactive Archive space specialises in showcasing science, engineering, history and creative thinking for groups for students aged 9-14 (but other ages will also enjoy the experience). We also offer a variety of workshops to coincide with your visit tailored to the year group and curriculum. We also offer our workshops on an outreach basis and can come to you with our Pop up exhibition. Scroll down the page for further information. Why not have a tour and meeting in our space. Further your knowledge of Coventry’s industrial heritage and a lesser known local hero. We also offer our workshops on an outreach basis and can come to you with our Pop-up exhibition. Feel free to pop in and explore our Lanchester Interactive Discovery space any day of the week. For larger groups, or if you have a particular area of interest, feel free to contact us to allow us to accommodate you to our best ability. If you have any specific interests or anything you’d like to contribute then contact us to arrange a tailored visit. Try your hand at our Invention workshops. Create some Heath Robinson style ideas or tackle engineer’s problems of today. We can bring the Lanchester Interactive Archive to you! We have a pop-up exhibition that showcases some of the most exciting elements of the archive including AR experiences, serious games, together with some artifacts from the collection. Available for short term afternoon sessions or long term loan. Suitable for schools, libraries, events, exhibitions, and community settings.